St. George’s University will try to ensure that the information provided on its official World Wide Web site is accurate, timely and useful. However, in view of the possibility of human error or changes in medical sciences, neither the authors nor St. George’s University nor any other party who has been involved in the preparation or publication of this work warrants that the information contained herein is in every respect accurate or complete, and they are not responsible for any errors or omissions or for the results obtained from the use of such information. Readers are encouraged to confirm the information contained herein with other sources. Corrections and additions will be made as time permits. The university reserves the right to make changes in the curriculum, degree requirements, course offerings, tuition/fees, and all rules and regulations at any time and without prior notice. Copyright © 2017 St. George’s University, all rights reserved. 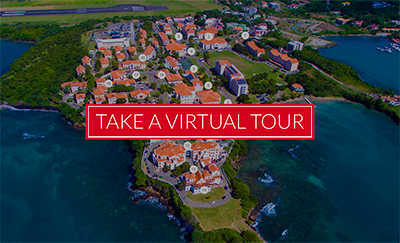 The material in the St. George’s University Web Site is the property of St. George’s University, except where specifically indicated. Duplication of this material for reasons other than personal use requires written permission from St. George’s University. It is the intent of St. George’s University to comply with the U.S. Copyright Law (Title 17, U.S. Code, Sect. 101, et seq.). This policy represents a sincere effort to observe the copyright law. Faculty, students, administrators and employees of the university and affiliated organizations are prohibited from copying copyrighted works unless the action is authorized by (a) specific exemptions in the copyright law, (b) the principle of fair use, (c) the fair-use guidelines, or (d) licenses or written permission from the copyright owner. Faculty, students, administrators and employees of the university and affiliated organizations are prohibited from “performing” copyrighted works unless the performance is authorized by (a) Title 17, U.S. Code, Sect. 110(1) (4) or (8), (b) performance licenses, (c) purchase order authorization, or (d) written permission from the copyright owner or the owner’s agent.